Amethyst Construction Inc. was formed in 1984 as a family owned engineering and construction company. We had only eight employees during the first few years. Growth was slow. However, local engineers and developers soon began to rely on our competitive prices and quality workmanship. Since the inception of the company, every owner or engineer that we have worked for would be used as a reference for future work. Amethyst has been involved in many small and many very large projects. Many highway projects from drainage to 4-lane reconstruction projects have been completed. We complete several large site development projects each year including: clearing and grubbing, earthwork, utilities, water and sewer, lift stations, concrete and asphalt paving, sidewalks, curb and gutter, structural concrete, irrigation, landscaping, and striping. This turnkey approach has allowed us to finish most projects ahead of schedule and under budget. Completed projects include: shopping centers, Target, Kmart, theaters, hospitals, restaurants, office buildings, power plants, and many others. We also construct many municipal projects, parking lots, and driveways. We market and sell crushed concrete, recycle asphalt, limestone, pit run, and fill dirt. 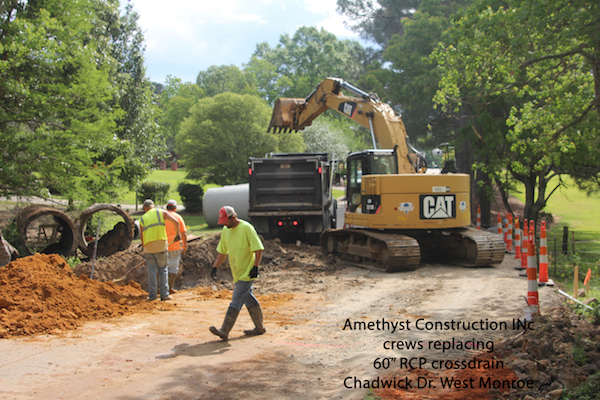 Amethyst is a major competitor on many highway projects for LA DOTD, municipalities, and parish governments. In addition, we work with many other contractors to form teams capable of constructing any size project. Our extensive fleet of heavy equipment and capable employees allows us to complete those projects in a timely and professional manner. Our continued growth is warranted by our commitment to maintain a capable, educated, and determined workforce. This also enables us to quote competitive prices and maintain the highest quality of workmanship on each of our projects.